This paper discusses the thermal analysis of rare earth grain refined 4130. To accomplish this, heats of 4130 Baseline, 0.3 wt% RE silicide, and 0.3 wt% EGR were poured in a thermal analysis cup with a single S-type thermocouple at the bottom. A data acquisition system recorded the cooling curves whose values were compared to reference data. The samples were sectioned and macroetched. A scanning electron microscope analyzed the samples to determine inclusion composition. 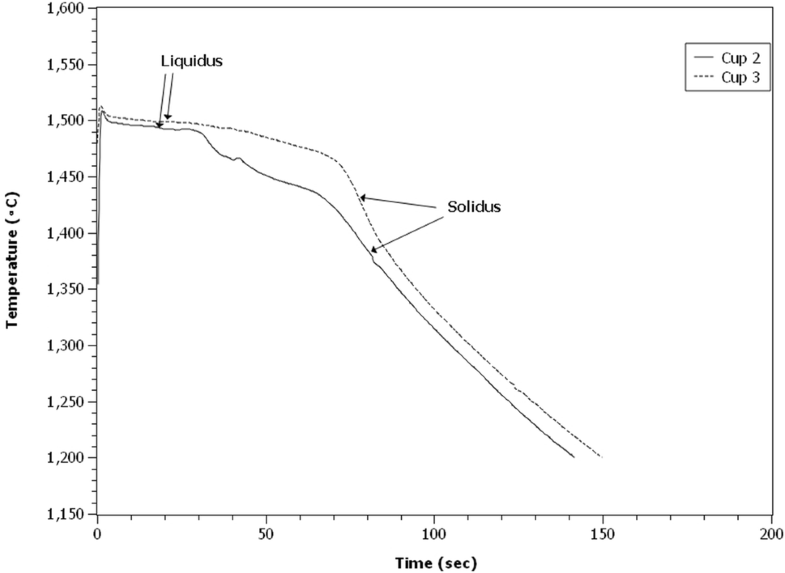 It was observed that the liquidus was similar for all the samples; however, the peritectic temperature for the 0.3 wt% RE and 0.3 wt% EGR was higher than the Baseline. This increase was thought to be due to RE oxysulfides acting as heterogeneous nuclei for austenite. 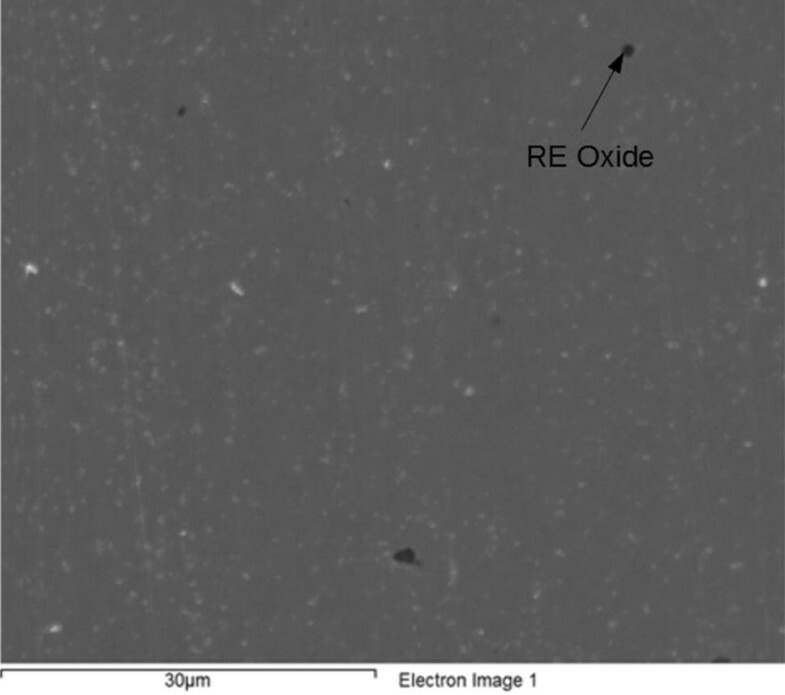 A number of additional peaks appeared in the grain refined steels that seem to be related to the formation of RE oxysulfides during solidification. Macroetching found a larger equiaxed region in the TA cups from the treated steels and a finer structure. The improvement in microstructure seems related to the RE inclusions and peritectic temperature increase. While the previously mentioned papers demonstrate that RE additions are associated with finer grain structures and improved mechanical properties, their exact mechanism has been debated. Some postulate that either RE segregation or grain pinning effects explain the observed improvements.18–20 Others have held the view that the RE oxides and sulfides formed act as heterogeneous nuclei.6,14–16 This debate continues due to the difficulty of interpreting the microstructures after the solid-state transformations during cooling. An additional tool is required to assist in examining the solidification of steel. Using thermal analysis could provide a better picture of what reactions occur during solidification. Another thermal analysis technique which has been used to study metals and has served as the primary tool to study solidification is differential scanning calorimetry (DSC). Phase reactions and their temperatures are determined by looking at heating and cooling of samples. It is primarily done in the heating mode where heat is applied to the sample and a reference. 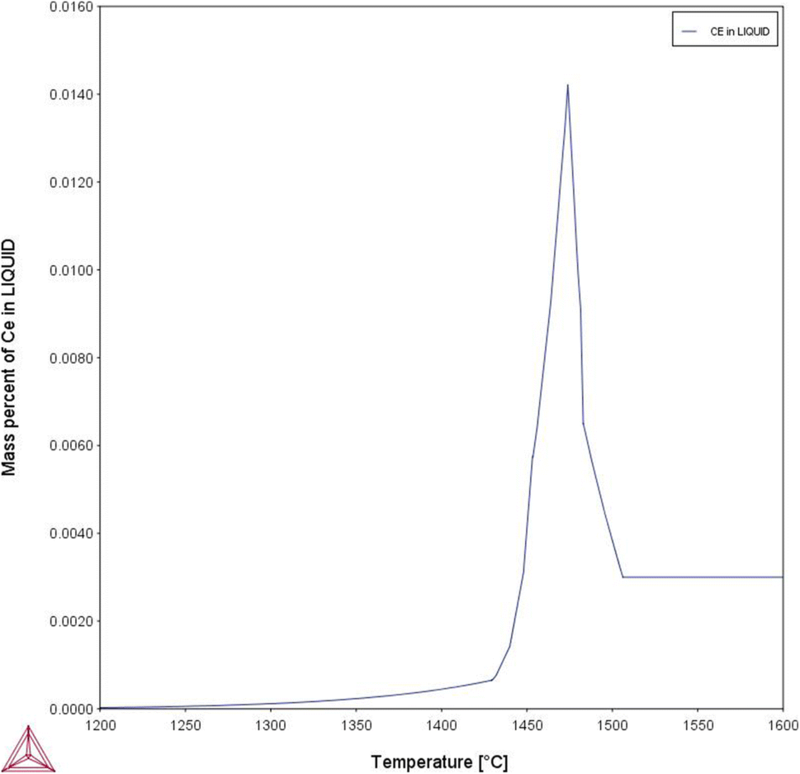 The amount of energy required to increase the temperature of the sample and reference are recorded, and the instrument reports the difference in energy. Phase transformations cause either an increase or decrease in the amount of heat required to heat the samples depending on whether the reaction is endothermic or exothermic. Samples in the 100–200 mg range can be used. DSC has been employed to study steel solidification across a wide range of alloys.31–35 Constructing units capable of 1600 °C temperatures has been very difficult, thus resulting in expensive instruments. DSC units are also only suited to laboratory environments. 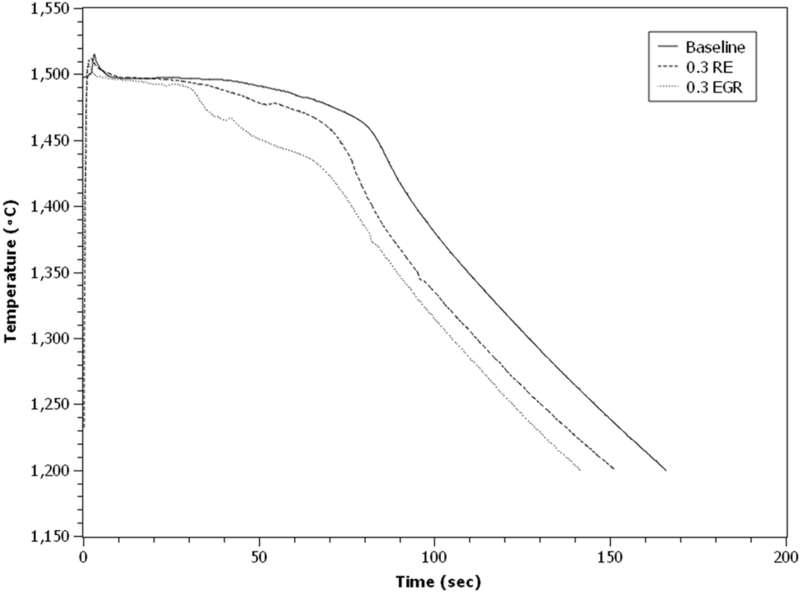 Researchers have noted significant difficulty in detecting the solidus and peritectic reactions.35,36 Therefore, only using DSC for examining steel solidification presents some significant issues. 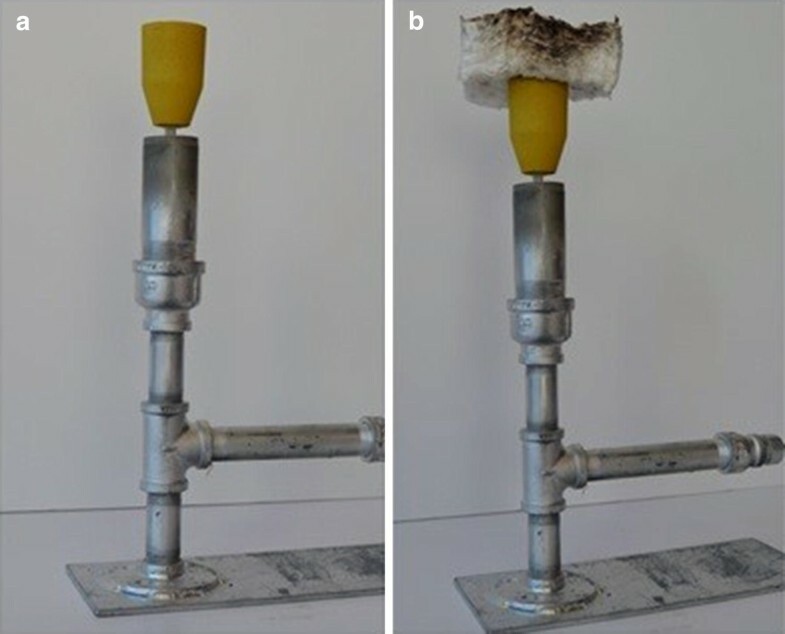 Considering the interest in RE-based grain refiners and solidification-based grain refinement in steels, the authors conducted a series of experiments on 4130 with RE additions. Heats of different conditions were melted and then poured into several thermal analysis cups. The goal of the work was to examine how the cooling curves and phase reactions changed when RE elements were added. RE additions were accomplished either using RE silicide or engineered grain refiner (EGR). RE silicide contains Ce, La, Nd, and Pr. The total RE content is approximately 30 wt%. EGR is a commercially available engineered grain refiner with cerium as the only RE element in it. Data from these experiments should provide a better understanding of how RE additions interact with steel during freezing. Another goal was to use the single thermocouple thermal analysis technique to provide a better picture of steel solidification and demonstrate that the technique can be successfully employed in steels. Multiple 23 kg (50 lb) heats of 4130 steel were melted in a 3-kHz induction furnace with an alumina crucible in air. The initial charge consisted of 1010 scrap, FeCr, and FeMo. When the temperature reached 1700 °C (3100 °F), FeSi, FeMn, graphite, and aluminum shot were added. The melt was further heated to 1730 °C (3150 °F) before tapping into a preheated 2.3-kg capacity fiber refractory hand ladle. To maintain deoxidization, a gram of aluminum shot was added to the hand ladle. Three different heat chemistries were produced: a Baseline heat, a heat with 0.3 wt%. RE silicide, and a heat with 0.3 wt% EGR. The melt was poured in a thermal analysis (TA) cup which was attached to a stand (see Figure 1). Each cup was filled to the top of the cup. Commercially available S-type shell sand thermal analysis cups from matrix sensors were employed. These sensors have an error range of ± 2 °C. The interior cup dimensions are 40 mm in diameter and 40 mm tall. The S-type thermocouple was placed in a quartz tube located in the center of the cup. The TA stand is attached via S-type compensation wire to a DAQ built by MeltLab. This DAQ system plotted and analyzed the cooling curves. The system used in this experiment generated cooling curves as well as differentiating the curves as high as the fifth derivative. It also contained algorithms for data smoothing to assist in determining the liquids, solidus, and other phase reactions. The system used in this experiment has been widely used for iron and aluminum alloys. The sampling rate of the DAQ was 38.4 kHz. Data acquisition automatically stopped when the temperature reached 1200 °C. TA cup conditions (a) normal and (b) covered. To determine the best method for examining steels, some TA cups were normal (uncovered), while others were covered using a ceramic fiber blanket with a density of 128 kg/m3 (see Figure 1). The top cover had a thickness of 5 cm and a length and width of 15 cm. Four cups were poured per heat, two cups for each condition. After filling the first cup, the remaining metal was poured into a mold from which a chemical sample was then extracted for optical emission spectroscopy (OES). Table 1 depicts the chemical composition of each heat. The OES spectrometer used in these experiments has a calibration for cerium in a steel matrix. Only cerium was reported because there are no certified reference materials (CRM) for the other RE elements in a steel matrix. Thus, cerium was used as a proxy for all the RE elements. After cooling to room temperature, the TA cups were sectioned and polished for macrostructure examination. The samples were sectioned 2 cm from the bottom cup surface using a high-speed sectioning saw. The samples were then ground using 180-, 320-, and 600-grit SiC sand paper. Macroetching employed a 25% HNO3 and 75% H2O etchant. Macrostructure images were taken using a Nikon D3200 DSLR camera under illumination. The samples were further analyzed using a JEOL 5400 SEM with an Oxford Instruments INCA EDS system. 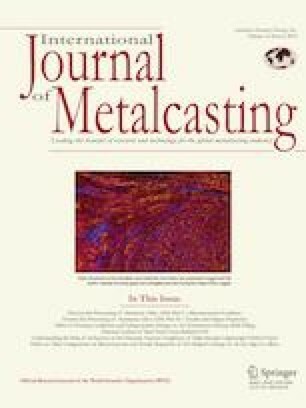 This analysis focused on the inclusions present in the steel, their composition, and their effect on the microstructure. The maximum temperature recorded on the cooling curve data provides the ability to verify the similarity of the pouring conditions. The average maximum temperature for the Baseline, 0.3 RE, and 0.3 EGR samples were 1513 °C, 1506 °C, and 1510 °C (see Table 2). Cups from the same heat were within 12 °C of each other. Also, the pouring temperatures between cups were no more than 15 °C different in the most extreme cases. Thus, the cooling curves were comparable. Peak Temperature on the Cooling Curves for Normal Cups. Figure 2 illustrates the cooling curve data for the 4130 Baseline covered TA cups. Figure 3 graphically depicts the cooling curves for the 4130 Baseline normal TA cups. The cooling curves in Figure 2 have a large variation between each other. The cooling curves for the normal TA cups had less variance. Also, while not shown, the covered TA cup data had much noisier data and broader peaks that made phase reaction identification from the cooling rate of the cups practically impossible. Due to this consistency difference, the normal cup conditions were used in this paper for comparisons. Cooling curve for covered 4130 Baseline cups. Cooling curve for normal cups in the 4130 Baseline. Figure 3 illustrates the cooling curve for 4130 Baseline in the normal condition. It was observed that the curves are very similar indicating good repeatability. The time difference between the two was a result of normal experimental variation. The solid line had a superheat of 17.8 °C, while the dashed line had a super heat of 10.2 °C. Figure 4 presents the cooling curve for 4130 steel with RE silicide additions. The two cups have similar shapes and solidification time. There is some indication of a different phase evolution due to a new inflection point in the curves prior to the solidus (see Figure 4). This inflection point is more evident in the solid line (Cup 2). These inflections indicate a change in the solidification of the 4130. Cooling curve for normal 4130 0.3 wt% RE addition. Figure 5 shows the cooling curve of 4130 steel with EGR additions. Again, a new inflection point just prior to the solidus was observed. The presence of this inflection points to a difference in phase evolution caused by the EGR addition. Interestingly, there is a significant difference between the curves in Figure 5. It is not exactly apparent why this occurred since the cups were poured from the same heat and had pouring temperatures within 4 °C of each other. These cups were also poured back to back of each other so one would expect less differences due to oxidation of the melt. This may be an indication of fading in the melt. Cooling curve for normal 4130 with 0.3 wt% EGR addition. 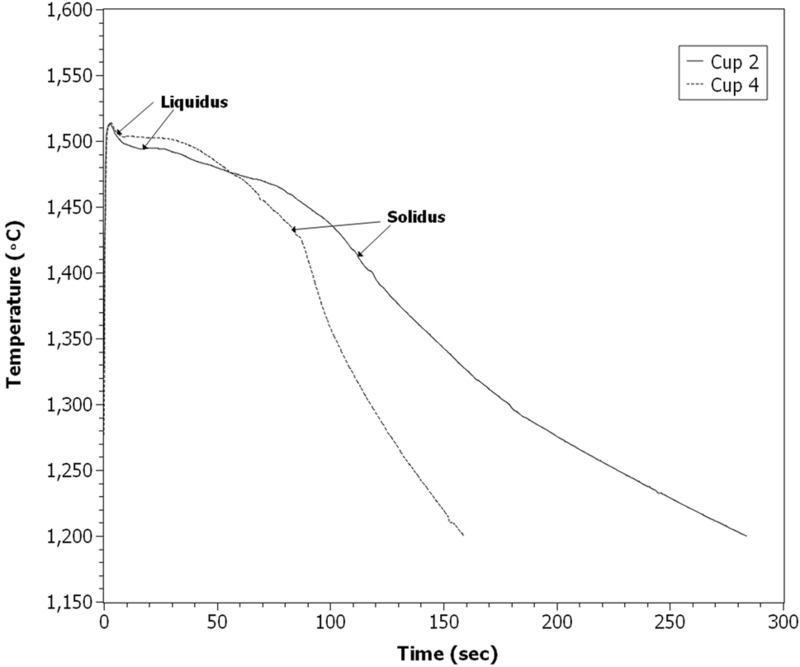 To clearly demonstrate how the overall shape of the cooling curves changed, the first cup from each experimental treatment was plotted in Figure 7. All three curves have very similar pouring temperatures as seen from the peak temperatures near 1510 °C. 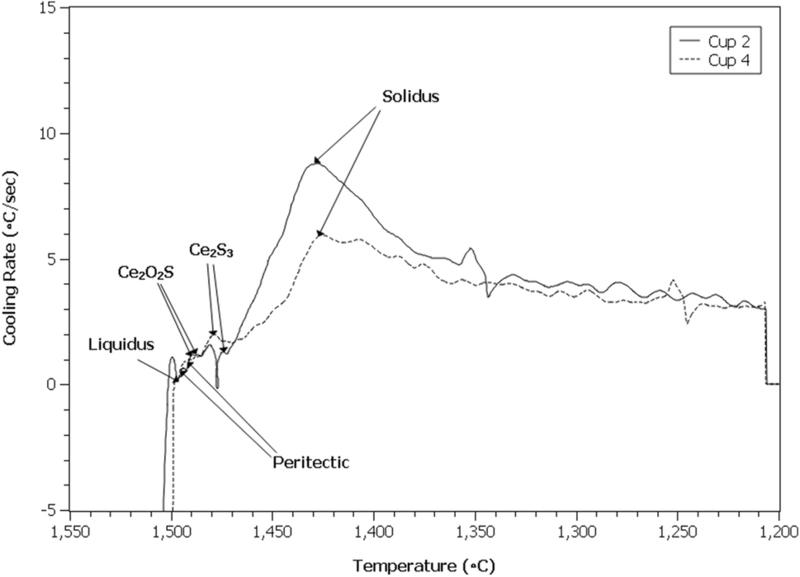 Between 1470 and 1480 °C, the peak inflections prior to the solidus appear in the 0.3 wt% RE and 0.3 wt% EGR samples (see Figure 6). The 0.3 wt% EGR curve, the dotted line, has a very different shape than the other samples. Two additional phases appear to form prior to the solidus compared to the Baseline (see Figure 6). The 0.3 wt% RE curve, the dashed line, shows the possibility of one phase forming prior to the solidus. These curves indicate a change in the solidification of the RE silicide and EGR samples occurred. Cooling curve comparison for normal, 0.3 wt% RE, and 0.3 wt% EGR. While examining the cooling curves can provide insight into any phase reactions that might happen, detecting these visually or with an algorithm can be difficult. Analysis of the first derivative of the cooling curve, or the cooling rate curve, frequently reveals smaller phase reactions or simplifies detection.37 The first derivative for each cup is plotted in Figures 7, 8, 9 and 10. The liquidus is detected by determining when the cooling rate curve first reaches zero since at that point cooling temporarily ceases due to the evolution of a fraction of the latent heat of fusion. Additional reactions are identified either as peaks or sharp valleys in the curves. Figure 7 depicts the cooling rate curves for the Baseline sample. Two sets of peaks are evident, one related to the peritectic and the second to the solidus. 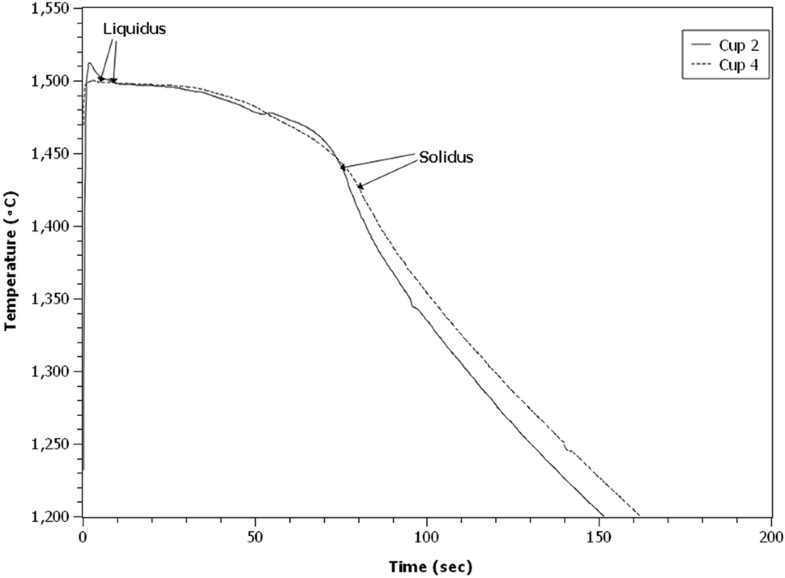 Identifying the solidus peak was relatively easy since it is associated with the end of solidification and the absorption of a large amount of energy. MeltLab’s existing algorithm for solidus detection had no issues identifying this peak. Detection of the peritectic peak was not automatic. Currently no algorithm exists for it; thus, manual analysis was required. When measuring the peritectic temperature, the peak in the peritectic was used. Confirmation of the peak was accomplished by using thermodynamic predictions from Thermo-Calc on the phases that should evolve during solidification.38 The cooling rate curves of the treated samples were far more complex (see Figures 8 and 9). Frequently, three peaks prior to the solidus were observed. The presence of these peaks certainly indicates a change in the alloys solidification and matches with the indications of a change in the cooling curves. Figure 10 provides curves from the Baseline, 0.3 wt% RE, and 0.3 wt% EGR samples to make the presence of the extra peaks more evident. Figure 10 also shows that the treated samples had much more complex shapes than the Baseline. Cooling rate for normal 4130 Baseline. Cooling rate for normal 4130 with 0.3 wt% RE additions. Cooling rate for normal 4130 with 0.3 wt% EGR additions. Cooling rate comparison of normal 4130 Baseline and with additions. Identification of the peaks in treated steels required the use of Thermo-Calc. Using a Scheil calculation based on each heat’s composition and an oxygen content of 28 ppm, the authors found that the most likely phases are Ce2O2S and Ce2S3. Only cerium was added in the computations as it was the only RE element included with the TCFE9 steel database. It was interesting to note that the Scheil predictions indicated that the peritectic occurred prior to the formation of either phase. In the cooling rate curves, it had been expected that the peritectic peak would have appeared in a similar position to the Baseline with Ce2O2S and Ce2S3 formation occurring in the relatively small region between the peritectic and solidus that is observed in Figure 8. The authors would like to note that there are significant limitations with the phase identification since XRD data would be more conclusive. Using the existing algorithms in MeltLab, the authors tabulated the liquidus and solidus for each cup. Table 3 provides the average liquidus for each steel. Solidus data are listed in Table 4. Included in the tables are the predicted values from Thermo-Calc and reference data from A Guide to the Solidification of Steels.27 The liquidus data appear very close to each other both in the two sets of reference data and these experimental measurements (see Table 3). However, there is a discrepancy when examining the solidus. The predicted and reference solidus temperatures are 10 °C apart from each other. The Baseline solidus is higher than either the predicted or reference solidus for the alloy (see Table 4). There also appears to be a trend of decreasing solidus with the addition of RE or EGR. EGR additions produced the lowest solidus, which match the Thermo-Calc predictions. The reason for the large discrepancy between the solidus values, especially the two reference values, was not immediately apparent. It may be related to differences between the experimental techniques used to provide the data. Most of the solidification data within the thermodynamic databases are based on DSC.39 The reference data used a controlled heating and cooling furnace technique with a single thermocouple inserted into the melt.27 These techniques appear somewhat similar and should achieve similar solidus temperatures. One factor which might explain the difference in measured values is the samples sizes. As is generally known, DSC samples range in the 100–200 mg range. The reference data used a 35 g sample size.27 A larger sample size would result in a higher amount of energy evolved from the latent heat of fusion, causing a higher temperature and easier detection. Another possibility is that the smaller sample size cools faster than the larger samples and undershoots the solidus temperature; however, DSC uses a controlled heating or cooling process so this seems less likely. The samples in this experiment were 270 g and thus are larger than either of the other techniques which correlate with this work’s higher solidus in the Baseline data. The peritectic temperature from the Thermo-Calc prediction, reference data, and experimental data are collected in Table 5. Again, there is a discrepancy between the predicted peritectic temperature and the reference data which likely reflects the slightly different experimental techniques. 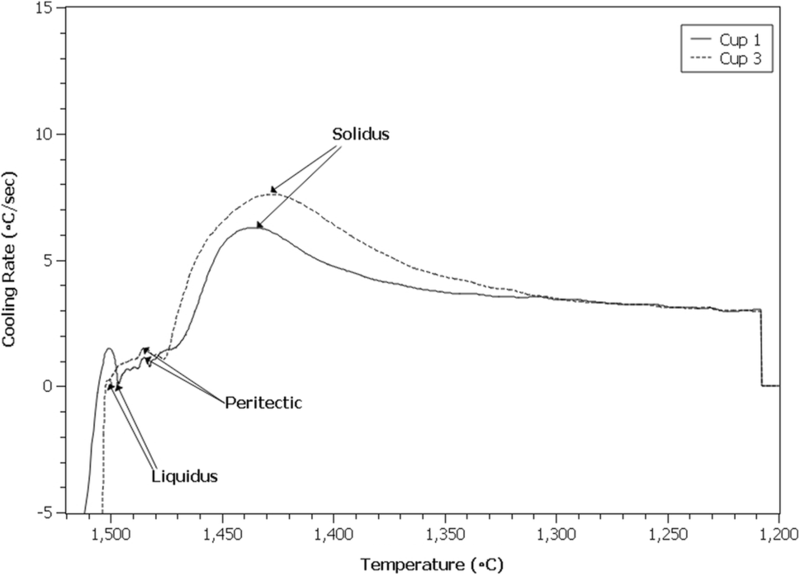 Unlike the solidus data, the Baseline peritectic temperature appears to be very similar to the Thermo-Calc predictions. It is also interesting to note that the treated steels had a higher peritectic temperature than the Baseline steel. Macroetching exposed the solidification structure of the TA cups. Representative cups from the Baseline, 0.3 wt% RE, and 0.3 wt% EGR steels are depicted in Figure 11 with the interface between the columnar and equiaxed regions delineated by a white line. Identification of the columnar-to-equiaxed transition (CET) was easiest in the Baseline since the grains were the largest. The 0.3 wt% RE and 0.3 wt% EGR samples proved more difficult due to their finer structure. It appears that the equiaxed region expanded in the treated steels. Additionally, the grain size decreased considerably. The average grain size for the Baseline, 0.3 wt% RE, and 0.3 wt% EGR was 4.18 mm, 2.24 mm, and 2.54 mm, respectively. The large dark spots are gas pores caused by the decomposition of the shell core binder in the TA cups. This location within the cup is prone to this; however, the region where the thermocouple is completely full. 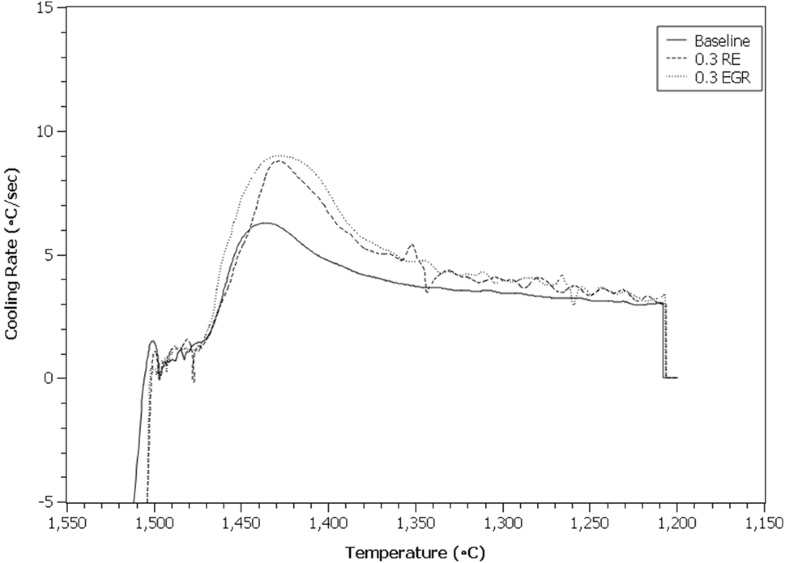 Macrostructure of 4130 steel (a) Baseline, (b) 0.3 wt% RE silicide, and (c) 0.3 wt% EGR. SEM image of 4130 Baseline. RE oxide from 0.3 wt% RE steel. 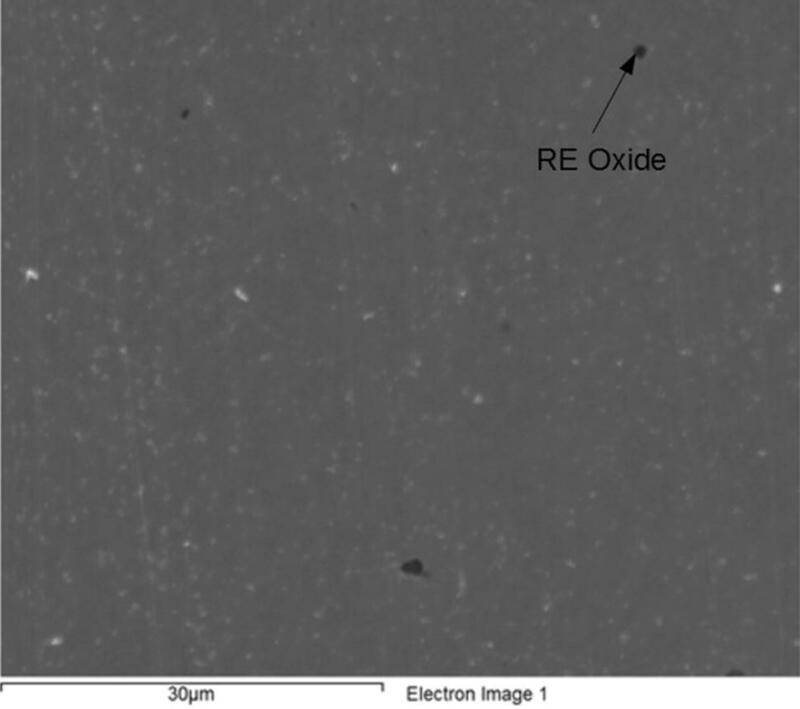 Typical RE oxide in the 0.3 wt% EGR sample. Based on the Thermo-Calc predictions, the reader would expect Ce2S3-type inclusions. The expected composition would be 74.5 wt% Ce and 25.5 wt% S. Some inclusions of the Ce2O2S type might have also been expected. These would have had a composition of 81.4 wt% Ce, 9.3 wt% O, and 9.3 wt% S. However, nothing similar to this composition was observed either. Instead, the typical total rare earth (TRE) content of the inclusions seemed to be between 2 and 10 wt% with a significant amount of iron and aluminum. The iron may come from the surrounding steel matrix, but other work demonstrates a small fraction of it comes from the inclusions.26 It is possible that the observed inclusions formed within the melt when the RE silicide or EGR was added to the melt. Their formation might be driven by the high alloying contents within small regions of the melt during initial addition melting. Such a condition frequently occurs and thus seems likely. However, the thermal analysis results reveal that some type of phase forms during solidification with RE and EGR. The most likely candidates would be Ce2O2S and Ce2S3. Previous work by the author found that the inclusions typically being formed appeared to be more complex once isolated.40,42 However, the data did not prove completely conclusive. It may be that RE-containing inclusions are formed in the melt, despite not being predicted by Thermo-Calc, and these act as nuclei for the formation of Ce2O2S and Ce2S3. Such a situation would explain the previous work and why isolated Ce2O2S and Ce2S3 inclusions were not found in this work. The Ce2O2S and Ce2S3 inclusions may be on the surface of the RE-containing inclusions where they are hard to detect in the SEM. This situation would also explain why the formation temperatures observed in thermal analysis are slightly higher than the thermodynamic predictions. If the RE-containing inclusions are acting as nuclei or RE element sources, then they would reduce the energy barrier for formation and cause an increase in the reaction temperatures. Both the thermal analysis and macrostructure results show that the solidification of 4130 changes with the addition of RE silicide or EGR. Inclusion formation shifts to more RE-containing inclusions. However, the RE inclusions found do not correspond to those predicted by Thermo-Calc. The interaction of these factors remains not completely obvious. The composition of the inclusions in this work and in previous work by the author tends to have more oxygen than predicted by the Thermo-Calc analysis.6,9,40,41 This higher oxygen content indicates that these inclusions formed in a higher oxygen content environment. The addition of RE silicide and EGR occurred just prior to tapping for the first cup, so the oxygen level of the melt was higher. 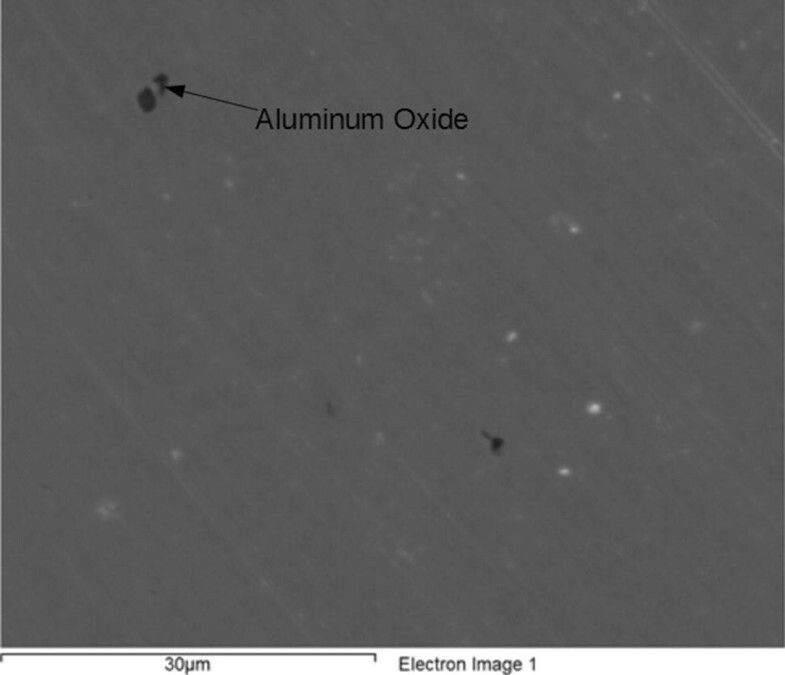 Thermo-Calc only predicts the immediate formation of alumina; however, a review of thermodynamic data by Wauby indicates that Ce2O3 should be thermodynamically more favorable than alumina.7 The higher oxygen content of the observed RE inclusions appears to indicate that they formed in the melt prior to solidification. This would also explain why their composition does not correspond to either Ce2O2S or Ce2S3. It appears that Thermo-Calc does not predict the formation of these inclusions. The thermal analysis results indicate that the peritectic temperature appears to increase with the addition of the RE silicide or EGR. In fact, the peritectic temperatures of these alloys were very close to each other, but higher than the Baseline sample by approximately 10 °C. This may indicate that the RE inclusions within the steel act as nuclei for austenite. These inclusions would assist the formation of austenite and increase their stability within the melt thus increasing the reaction temperature. Such a theory is supported by the fact that many of the RE compounds have a good crystallographic fit with austenite.6,10,14,16,19,43–46 Previous work by the author also corroborates such a theory when it was observed that alloys where austenite composed more of the freezing range responded better to RE silicide and EGR grain refining additions.41 This increase in reaction temperature is also the basis for characterizing grain refinement in aluminum alloys or inoculation in cast irons.37 Another side effect of the RE inclusions matching austenite and assisting refinement of that phase would have no noticeable effect on the liquidus of the alloys since the initial phase is δ-ferrite. 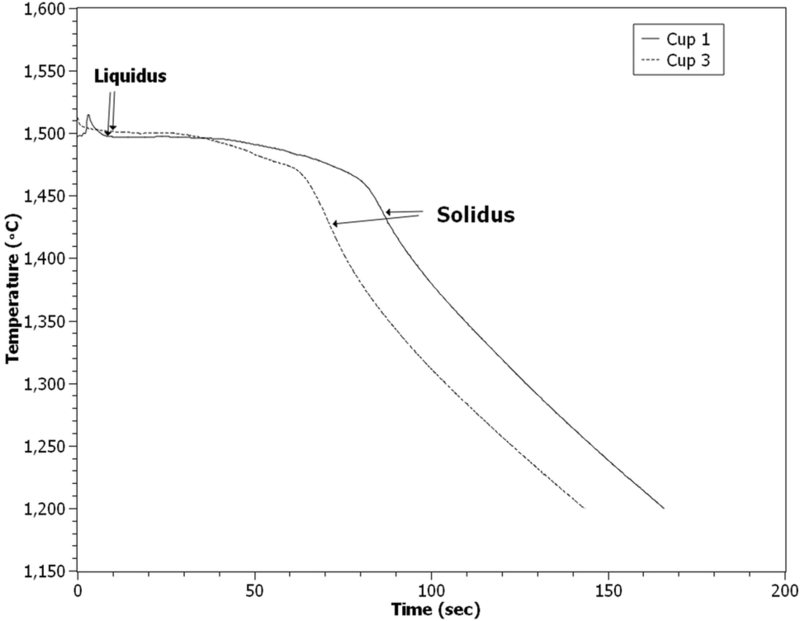 This is consistent with the observations that all samples had a similar liquidus temperature. The finer structure observed from macroetching indicates that the RE additions have refined the structure. As stated earlier, this refinement could be caused by either segregation-induced growth restriction or RE inclusions acting as heterogeneous nuclei. The amount of cerium or other rare earths is relatively low and would not be expected to cause significant growth restriction. 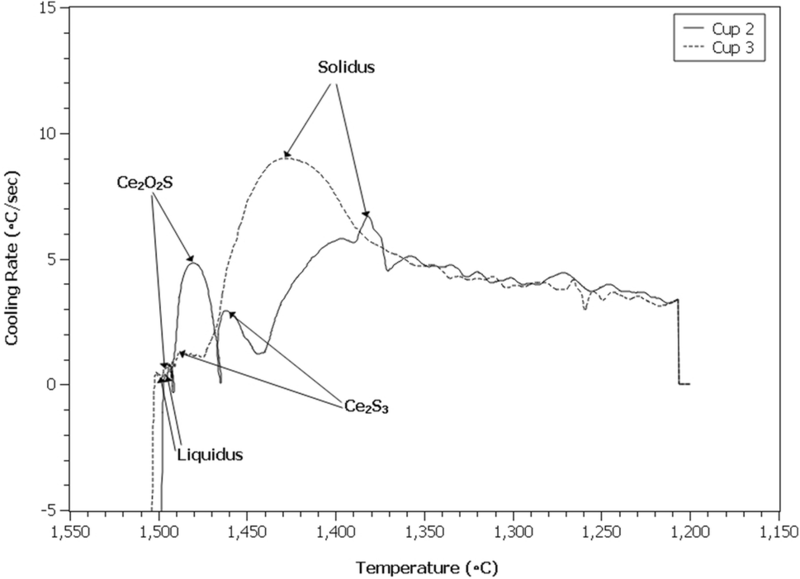 Additionally, the authors computed the cerium content as a function of temperature over the solidification range of 4130 (see Figure 15). Cerium segregation does not significantly begin until the liquidus occurs and reaches a maximum at 1472 °C, where the formation of Ce2O2S causes it to decrease. This temperature does not correspond to the observed peritectic temperature. Also, the thermodynamic predictions show no change in the peritectic temperature due to the cerium content. Thus, it would be expected that no change in peritectic temperature should occur if the refinement observed had been due to grain growth restriction. 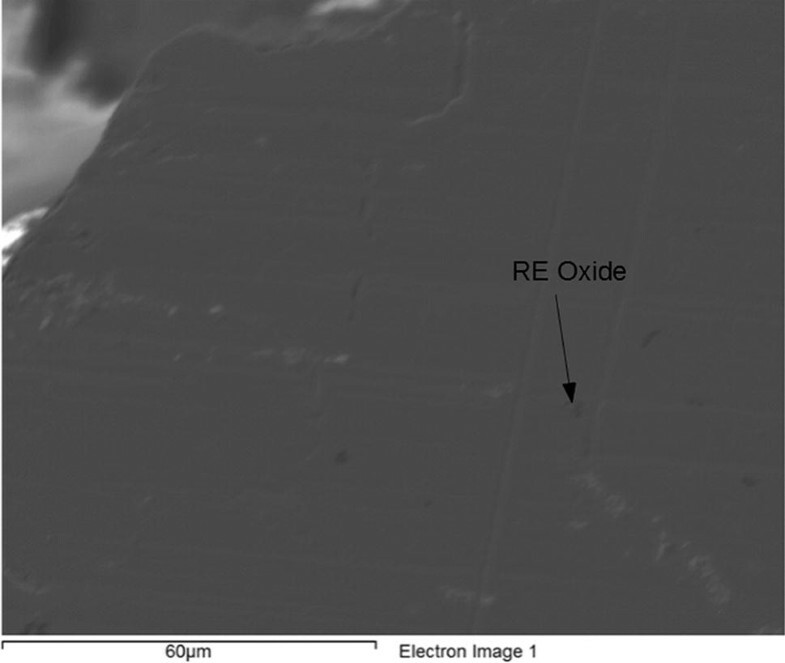 The structure refinement being caused by the RE inclusions does match observations in other alloying systems. A reduction in undercooling or increase in solidification temperature has been found when inclusions act as heterogeneous nuclei.4,47,48 This correlates with the observed increase in peritectic temperature. Therefore, the most likely theory that explains the peritectic temperature and solidification structure would be that the RE inclusions are acting as heterogeneous nuclei for austenite. They have expanded the region over which the austenite phase is stable. That increased stability appears to occur soon enough in the solidification of this alloy that they can cause refinement. Cerium content of the liquid as predicted by Thermo-Calc. The application of thermal analysis to the study of steel grain refinement was presented in this paper. RE silicide and EGR additions caused a significant change in the solidification of 4130. Additional phases were found to evolve during solidification. The peritectic temperature appears to increase with these additions as well. No change in the liquidus was found. Macroetching revealed an increase in the equiaxed region in the treated TA cups and a finer structure. RE-containing inclusions whose composition varied from the thermodynamic predictions were also observed. The refinement observed in the microstructure most likely occurs through the RE-containing inclusions acting as heterogeneous nuclei. While the segregation of cerium in the melt theoretically has the potential for reducing dendrite growth and thus refining the structure, such a mechanism would not produce the change in peritectic temperature. Additionally, thermodynamic predictions of the segregation indicate only a significant buildup in the later stages of solidification. Heterogeneous nucleation of the solid by the RE-containing inclusions would increase the peritectic temperature if they were a better match with austenite. This would expand the portion of the freezing range over which austenite is stable and allow its formation to occur, while the nucleation rate in the melt was higher. The result would be a higher peritectic temperatures, no increase in the liquidus, and a finer structure which matches with the observations in this work. The thermal analysis system used in this work provides vital information, particularly on the peritectic, for studying the solidification of steel. It was capable of detecting small reactions which are difficult to observe in other techniques. This information assists in interpreting the underlying mechanisms for grain refinement. However, it must be combined with other techniques to provide a full picture. The authors would like to thank the Office of Naval Research for financially supporting this work under Award Number N000141712766. Appreciation to Tyler Schramski and Hunter Towalski is also extended for their efforts in producing the material for this work. The authors value MeltLab’s assistance in understanding the practicalities of thermal analysis and modifying their software based on our discussions to provide a better steel analysis. Support from FOSECO through for their donations of various consumables for conducting these experiments was invaluable. Lastly, Jennie Tuttle’s efforts in editing this paper are also acknowledged.